Virginia Mason Athletic Center – Renton, WA – Target Technologies International Inc.
Home of the Seattle Seahawks, the Virginia Mason Athletic Center located on the southeastern shore of Lake Washington in Renton, WA is the headquarters and practice facility of the NFL’s Seattle Seahawks. This state of the art 200,000 square foot waterfront facility is the second largest in the NFL. 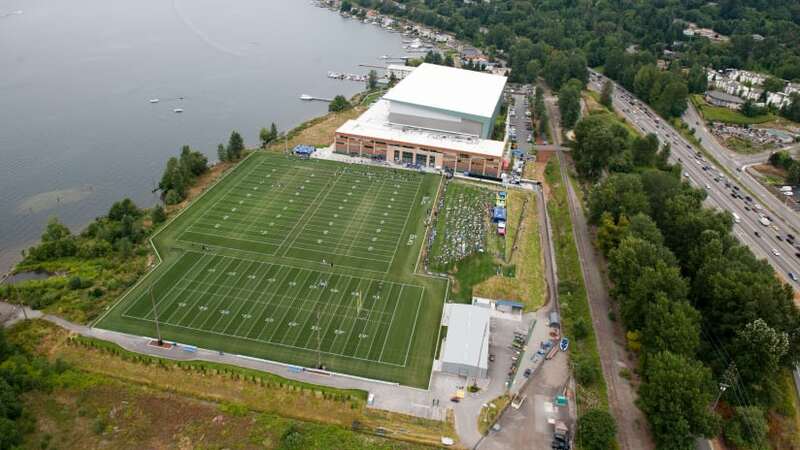 The VMAC situated on 19 acres of industrial property features one indoor regulation size artificial field with a clear height of 95’ allowing for kicking and punting, three outdoor regulation size grass fields, weight and training rooms, media production studios, coaching, draft and administrative offices, player meeting space, lounge/cafeteria and more! In addition, VMAC has provided an area for fans to watch practice during training camps. GO HAWKS! TTII is pleased to supply our top quality infill material for this exceptional facility.